The first installment of the papers of Chicago-born SF author Fred Saberhagen has arrived at the Department of Rare Books and Special Collections at Northern Illinois University. Saberhagen, who passed away in 2007, lived for last thirty years in New Mexico. He published 60 novels and numerous short stories, most of them belonging to one of his well-known sf and fantasy series, the most famous of which is the Berserker series about sentient beings’ war against ruthless machines determined to destroy all life. 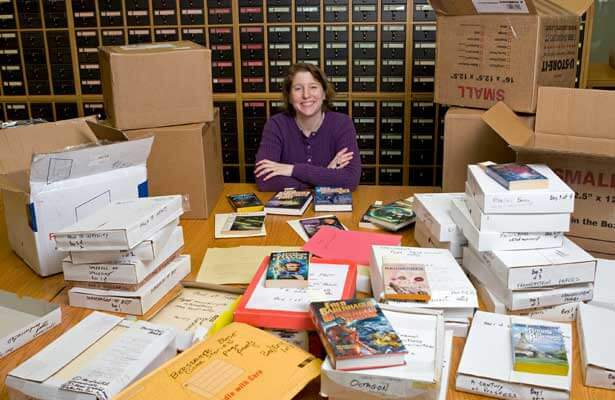 Lynne M. Thomas is curator of Rare Books and Special Collections for NIU Libraries, and an sf celebrity in her own right, having won a Hugo at Renovation for Chicks Dig Time Lords: A Celebration of Doctor Who by the Women Who Love It which she co-edited with Tara O’Shea. Thomas calls Saberhagen’s papers the “crown jewel” of the library’s science fiction and fantasy collection. That’s quite a compliment, for the collection already includes the papers of more than 50 other genre authors. Those authors include Alma Alexander, Eleanor Arnason, Robert Asprin, Kage Baker, Elizabeth Bear, Donald J. Bingle, Alex Bledsoe, Tobias Buckell, Richard Chwedyk, Pamela Dean, Lori Devoti, L. Timmel Duchamp, Carol Emshwiller, Philip Jose Farmer, Eric Flint, Merrie Haskell, Jim C. Hines, Douglas Hulick, John Klima, Mary Robinette Kowal, E.E. Knight, Ted Kosmatka and Naomi Kritzer, Catherine Lundoff, Elise Matthesen, Kelly McCullough, Jack McDevitt, Sarah Monette, Lyda Morehouse, Jaime Lee Moyer, Pat Murphy, Sean Michael Murphy, Nnedi Okorafor, Rebecca Ore, Jody Lynn Nye, Tamora Pierce, Tim Pratt, Cherie Priest, Sarah Prineas, Cat Rambo, Mark Rich and Margaret Ronald, Heather Shaw, Nisi Shawl, Will Shetterly, Sharon Shinn, the esteemed Steven H Silver, Kristine Smith, Bud Sparhawk, Jennifer Stevenson, Caroline Stevermer, Catherynne Valente, David Weber and Patricia Wrede. The library’s Rare Books and Special Collections department also holds the 20th World Science Fiction Convention Collection of correspondence related to the 1962 WorldCon. Lynne M. Thomas with Saberhagen papers.